Don’t haul everything home. Contact one of our Storage Specialists to reserve your unit for convenient and affordable storage. We’re under 3 miles from the UR campus! Our rates are set to reflect a good value for the service. 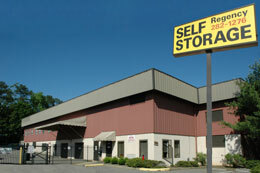 At Regency Self Storage we make renting easy & affordable. Start today, call (804) 282-1276 or contact our Storage Specialists to determine the correct storage unit size for you, so you aren't renting more than you need. With your own computerized access code you can get into our storage facility and your storage unit at your convenience during our extended gate hours and most holidays. Our Central Virginia location is conveniently located in West End of Richmond and is easy to find. We have easy Payment Options with No Long-Term Contract. We accept all major credit cards & can even set up auto payment or monthly billing for your rental. We offer a full range of packing & moving supplies & will pre-package a phone order & have it ready to pick up on your arrival. We have all indoor storage units that range from 5' x 5' (25 sq. ft.) all the way up to 15' x 30' (450 sq. ft.) We also offer humidity control units. It is the humidity, not the temperature, that can affect some of your more delicate items. Our gated facilities are lighted at night and the facility is equipped with surveillance cameras. For peace of mind we make available additional insurance purchase information.